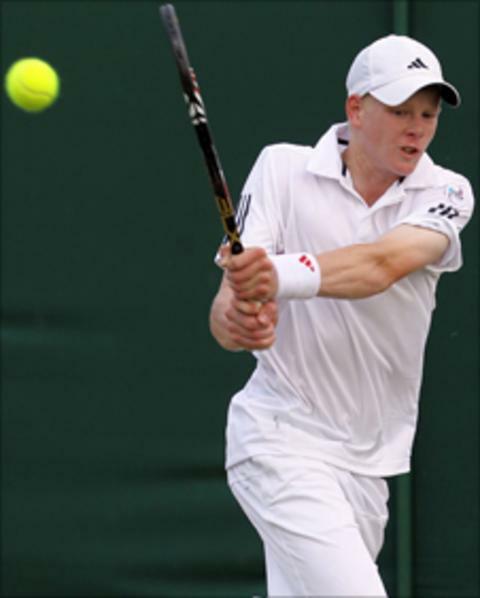 Beverley's Kyle Edmund pulled off a first-round upset by beating Brazilian 11th seed Joao Pedro Sorgi in the boys' singles in straight sets, 6-3 6-3. Fourth seed Oliver Golding came through a scare to beat Russia's Aslan Karatsev in three sets, 4-6 7-6 6-4. Welsh wildcard Evan Hoyt, Bolton's George Morgan and Stockport's Liam Broady are also through. In the girls' singles there were impressive wins for Francesca Stephenson and Ruth Seaborne. Hersham's Stephenson beat Japan's Makoto Ninomiya 6-4 6-2 while Seaborne recovered from a set down to beat American Gabrielle Faith Andrews 2-6 6-3 6-4. Londoner Golding was broken early in the first set before holding firm against the powerful Karatsev in the second to level after a tie-break. The former child actor then raced ahead in the third before overcoming a break in play, while Karatsev received treatment for an injury, to serve for the match. Welsh wildcard Hoyt, who was being watched by former British number one Jeremy Bates, fought back from an early break before going on to beat Spain's Axel Alvarez Llamas 6-3 6-4. The Lllanelli youngster had to save two break points at 5-4 up in the second set before booking his second-round clash with Croatian eighth seed Mate Pavic. Morgan, the 10th seed, beat Romania's Teodor Nicolae Marin in three sets, 6-4 4-6 6-1, while Edmund, who was one of Rafael Nadal's warm-up partners in 2010 and has worked with Swedish fifth seed Robin Soderling this year, will now face Belgium's Julien Cagnina. Broady, the brother of Naomi who lost to Anne Keothavong in the women's first round, needed three sets to beat Australia's Nick Kyrgios, 6-3 6-7 6-2. Stephenson had to fight back from an early break to overcome Ninomiya and will now face Ukranian Sofiya Kovalets. Oxfordshire's Lucy Brown was beaten in straight sets by Australian 12th seed Ashleigh Barty, 6-3 6-4 while Paraguayan sixth seed Montserrat Gonzalez beat Loughborough's Katie Boulter 6-4 6-2. Roehampton's wildcard Jonathan Cornish was knocked out in straight sets by Czech first seed Jiri Vesely, 6-4 6-2 while Somerset's Andrew Bettles was easily beaten by Spanish sixth seed Roberto Carballes Baena, 6-3 6-4. Buckinghamshire's Toby Martin went down in straight sets to Belgium's Kimmer Copperjans, 6-4 6-4 while Luke Bambridge was beaten 7-6 6-3 by Austrailian ninth seed Andrew Whittington. Fellow Nottingham junior Joshua Ward-Hibbert is already through to round two after beating Maxim Dubarenco of Moldova, 7-5 6-4, on Saturday while Londoner Oliver Hudson came through his clash with South Africa's Wayne Montgomery in three sets, 6-4 3-6 7-5. In the girls' draw Norfolk's Pippa Horn lost 7-6 7-6 to Stephanie Nauta of the USA and Sheffield's Jessica Ren was beaten by Austria's Barbara Haas in straight sets, 6-0 6-4. Katy Dunne lost 6-2 7-6 (7-5) to Japan's Nao Hibino and Laura Deigman was beaten 3-6 6-3 6-4 by Brazil's Beatriz Haddad Maia.